Sustainable Beef, Sheep and Swine Production in WI-What is It? and Where Do We Find It? Workshops and a farm tour will be offered where youth will have the opportunity to define and explore sustainable livestock production. Speakers and presenters will offer real life experiences detailing how they raise beef, sheep and swine sustainably on their home farms. 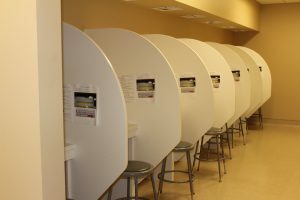 UWEX, tech school and college educators will present research that supports the three pillars of sustainability. 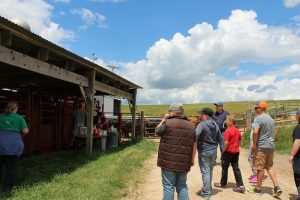 Youth participants will have the opportunity to tour farm businesses and industries that produce and market livestock in ways that are profitable in the long run, protect the environment and provide for quality of life. This project will be broken down into one and a half hour workshops held in February, March, April and May of 2017 followed by a two-day farm tour in June. Four scheduled Sustainable Livestock Production workshops have been completed. These workshops ran for one and one half hours including 10 minutes of review, 20-30 minutes of presentations followed by questions and discussion. 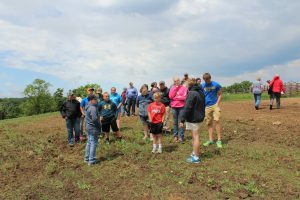 I have 14 youth participants from Jackson and Trempealeau Counties. They range in age from 5th graders to juniors in high school. They are all enjoying this project and gaining knowledge of sustainable livestock production. On February 18, 2017st Trisha Wagner, UWEX Ag Agent from Jackson County and I led the first workshop to get the participants thinking about what sustainability means to them personally. We used several of Diane Mayerfeld’s Toward a Sustainable Agriculture curriculum ideas. Trisha introduced the youth to the three pillars of sustainability using the 3-legged stool model. Participants were invited to write down their own definitions of sustainability on sticky notes and place them on the white board under the pillars of environment, economy or community. Trisha then led a discussion on the pillars and how they all work together. Next, I presented Activity 4 (Menus and Maps) from Diane Mayerfeld’s Module 1. Youth were given markers, paper plates and a placemat with a map of the world and asked to draw a meal that they had eaten in the last 48 hours. They were then asked to determine where their food came from using the world map placemat. Some kids found that they could identify sources of food that were produced on their own farms such as meat and vegetables. They also found that they had no idea where some of their food came from. To reinforce this concept I provided additional food products and we read the labels to find foods sourced from Brazil, Mexico, France and Thailand. This led to a discussion about us knowing very little about how these foods were produced and processed. 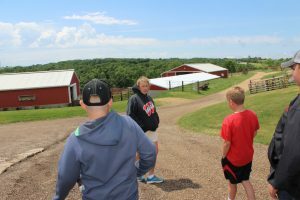 Next the youth viewed the power point slide show from Full Circle Farm to give them an idea of what a sustainable farm and sustainable livestock production can look like. In the final activity of this workshop we used a modification of Activity 3 from Module 1. Participants were given a worksheet to complete and turn in at the second workshop in March. 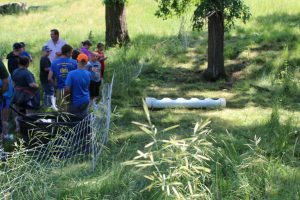 They were asked to identify 3 sustainable livestock production practices already in use on their home farms and/or with their 4-H beef, sheep or swine project animals. The second portion of this assignment asked participants to interview 2 family members from different generations and ask them to define sustainable livestock production. SARE-assignment-1, Sustainable Livestock Production Worksheet These questions were asked to get a family discussion of sustainability going on at home. A summary of responses is attached. SARE-assignment-1-completed, Sustainable Livestock Production Worksheet Summary From this first workshop youth and parents soon came to realize that there is more than one definition of sustainable and began to apply the concepts to their own personal ag experiences. The second workshop was held on March 21, 2017st. 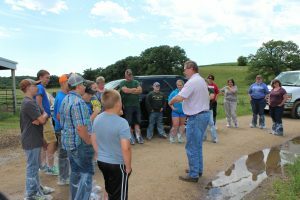 Dwight Carlisle spoke with youth about his life long journey in beef cattle production. Now in his 70’s, this gentleman has seen a lot of changes in agriculture and gave his perspective on the beef industry. Mr. Carlisle currently direct markets Waygu cross cattle from his 45 cow herd to upscale restaurants in Milwaukee and Chicago. He explained the differences in working and feeding these cattle versus a more traditional beef herd. 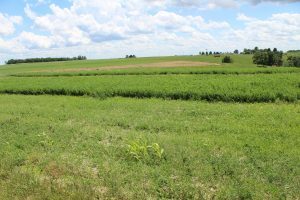 Some of his key points included: how he produces a specialized product for a niche market to generate more income, responsible land use to include cover crops, green manure, no-till planting and pasture management. He also remarked that his consumers want a story with their food-they want to know how it was raised and where it came from. Dwight emphasized how important it is to talk to people and make connections and to network with other producers. Our third workshop covered sustainable swine production on April 18, 2017. Ryan Mickelson gave his power point presentation on his family’s pastured pork, broiler, laying hen and market garden operation. Ryan is an alumnus of this county’s 4-H beef and swine projects. He raises pigs using controlled grazing on pasture and woods that had been out of livestock production for almost 20 years. He detailed how he has set up perimeter fencing as well as his rotational paddock system that he rotates pigs through. He explained that his system is easy on the pigs and easy on the producer. Ryan uses many forms of advertising to get the word out about their products to their target market. Word of mouth and social media are most effective for him and he showed us examples of his posts and his blog. As a result of this, many of the youth and even parents are now following him on his social media sites. Sustainable sheep production was featured at our fourth and final workshop on May 16th. Three presenters discussed rotational grazing, wool production and direct marketing of lamb. Jill Johnson spoke about her family’s flock of wool breed sheep that they rotational graze and out winter. They direct market fleeces and finished woolen items. Deanna and Duane Klindworth detailed how they direct market lamb from their 300 ewe flock. They explained that it is important to produce a unique and consistent product; they work with their meat processors to develop new products to keep up with consumer demand for quick and easy food prep. They offer product support such as recipes for consumers to try. They also are in their first year of providing sheep for contract grazing in a co-op’s solar field. 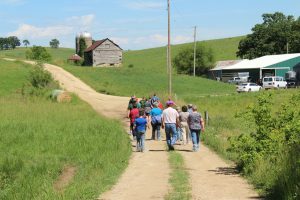 The next phase of this project was the two day farm and business tour in southwest WI on June 19th and 20th. Our first stop was at Organic Valley headquarters in LaFarge, WI. Our tour guide filled us in on the history of CROPP , Organic Valley, and Organic Prairie Meats. We were able to tour the facility and meet many of the employees. 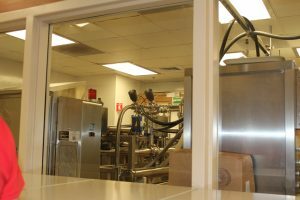 We also viewed the production area where they develop new products and the sensory panel area where they run taste tests. We then traveled to Lancaster to visit the UW Research Station. Manager, Arin Crooks filled us in on the research currently being conducted at the station. 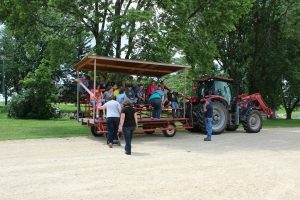 We then took a guided wagon ride and tour to see their rotational grazing system for the beef herd and viewed the many crop rotations and trials that they currently have in place. Of special interest was the trial they are about to start comparing the practice of pasturing beef cows in wooded areas and determining how this could effect not only the woods, but also cow productivity and conception rate. Out last stop of the day was at UW-Platteville’s Swine Unit. Manager, Alicia Prill-Adams gave us a tour of their swine building that features a composted manure system. Solids from the manure splitter at their Dairy Unit are transferred to the swine manure pits to absorb moisture. Manure pits are periodically cleaned and the manure mixture is then composted in a special shed where they can turn the pile to aid decomposition. When the compost reaches adequate internal temperatures it is then sold as organic compost. Alicia showed us the gestation and breeding areas as well as the farrowing rooms. UW-Platteville does extensive work with the Berkshire, one of the heritage breeds of hogs. 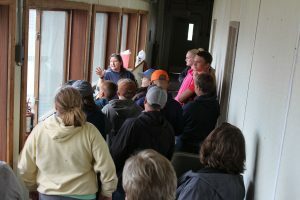 We viewed some of their herd sires and show pigs. Alicia also discussed their artificial insemination program and showed us the lab. Alicia Prill-Adams explains the swine facility layout and their manure composting process. 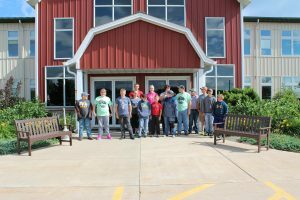 Our group spent the night at the Cooper Living and Learning Center located right on the UW-Platteville Farm. This gave the youth participants an idea of what dorm life can be like. The next day found us visiting two working farms. 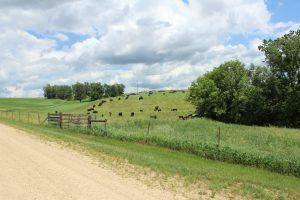 Our first stop was at Gaffney Family Cattle near Barneveld, WI. The Gaffneys have a registered Angus herd and merchandise breeding stock throughout the country using genomics as a marketing tool. Their 120 cow herd supports two families. Val Gaffney shared their experiences of starting small and growing their herd while utilizing grass and forage and managing their hilly pastures and being responsible to the land. Like many beef producers, they have faced challenges ranging from herd health, genetic defects, weather and fencing strategies. She emphasized the importance of paying attention to details and networking with other producers. Val Gaffney explains their facility setup. Val Gaffney talks fencing strategies and pasture management. I used this article along with several photographs from our sustainable tour to develop a trifold presentation. It was displayed at our county’s Beef Cookout where 1500 people were served. The trifold was also presented at our county Livestock Education Committee meeting as well as being on display at our county fair. 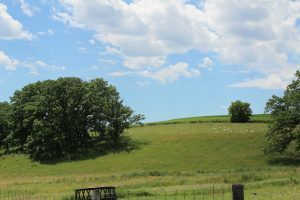 Our last tour stop found us at Gene Schrieffer’s farm near Dodgeville, WI where he rotationally grazes sheep and beef cattle. He took us on a pasture walk to view some of his ewes grazing, talked about his challenges with weeds and showed us some of his innovations such as a pasture waterer made from PVC pipe. He outlined his genetic selection process that effects the amount of labor required for his sheep flock. He is currently introducing hair sheep genetics in the hopes that he can eliminate shearing his flock. Since doing this project a group of six parents and myself meet quarterly to plan more educational events for the youth participants. We found that the workshops followed by tours is a great format to engage the youth and keep them excited about learning new things. We are starting the planning process for another tour(s) next summer and also exploring some fund raising ideas to carry out workshops or tours. Three young men, who happen to be cousins, convinced their grandfather to try out wintering his beef cattle herd after they learned about the practice in one of the workshops. Their explanation to him included the facts that they wouldn’t have to spend days hauling and spreading manure (the cattle would do that for them), there would be less fuel costs and consumption involved and less wear and tear on his machinery. A mom, dad and grandpa partnered with her 11 year old son/grandson to by some feeder pigs to feed out and direct market to consumers. Previously they only purchased show pigs for the county fair. Now they are using some social media ideas to help their marketing. They are feeding a balanced ration with the addition of excess garden produce and waste milk from their dairy to supplement the pigs diet. They plan to reinvest some of the proceeds from their pork sales into the next group of pigs to raise. A father and his daughter designed a rotational grazing system for their sheep flock and are finishing the last of the perimeter fencing. Their ewes will graze yet this fall until the snow is too deep. A mom and dad and their three children already farm organically and one of their farm enterprises is Red Wattle hogs. They learned about rotationally grazing pigs and are using their herd to clear some marginal land. Another set of parents already rotationally graze and out winter their sheep flock. They are fine tuning their program to make smaller paddocks and get better control of weed growth. This family also markets their wool crop by adding value to fleeces and producing some arts and crafts. Since learning about ways to market using social media they have set up a Facebook page for their farm and are having marketing success using this format. We knew that this entire project was a winner when participants were asking where we were going next year before we even got home from the two day tour. This grant allowed us to bring in knowledgeable and inspiring workshop presenters and to take kids to places that they didn’t even know existed. They are a group that is very excited about ways to sustainably raise beef, sheep and swine and they are sharing their newly acquired knowledge with their peers which is a very effective form of learning! 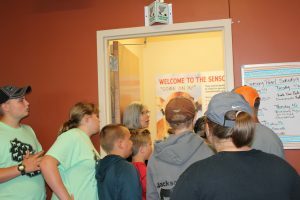 One young man was so impressed with one of the tour stops that he used the connections that he had made and was able to set up a job shadow experience at a veterinary clinic that does beef cattle embryo transfer work to bring in new and different cattle genetics.